Light refreshments, Poland Spring Water, Gatorade Endurance Formula, Gatorade Prime, Clif Bars, bagels, bananas, tenting, and portable toilets will be available. You must show your bib number upon entering. 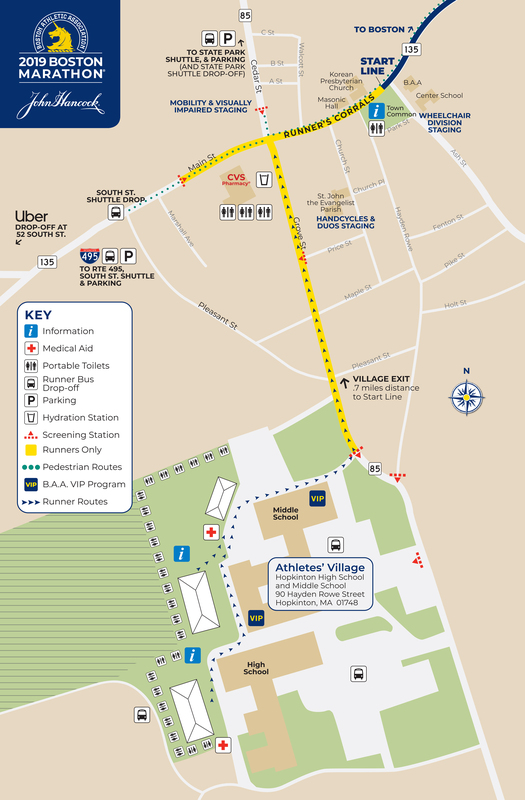 In order to exit the Village and enter the corrals in an efficient and orderly fashion, participants will leave the Athletes’ Village according to their assigned wave, bib number, and corral assignment, and will be directed down Grove Street to Main Street. Your starting corral is in a square box printed on your bib. It can also be found on your Number Pick-up Card. 101 – 7,900 1 and 2 9:15 a.m.
3 and 4 9:20 a.m.
5 and 6 9:25 a.m.
7, 8, and 9 9:30 a.m.
8,000 – 15,999 1 and 2 9:40 a.m.
3 and 4 9:45 a.m.
5 and 6 9:50 a.m.
7, 8, and 9 9:55 a.m.
16,000 – 23,999 1 and 2 10:05 a.m.
3 and 4 10:10 a.m.
5 and 6 10:15 a.m.
7, 8, and 9 10:20 a.m.
24,000 – 32,699 1 and 2 10:30 a.m.
3 and 4 10:35 a.m.
5 and 6 10:40 a.m.
7, 8, and 9 10:45 a.m. Participants will be lined up on Main Street only (click on map). Follow signs to your particular corral, which is located about .7-mile from the Athletes’ Village. All participants are numbered according to qualifying times, facilitating a start and pace comparable to others with similar qualifying times. Participants should line up in the corral they have been assigned. Bib numbers are color-coded. Red bibs are assigned to Wave 1. White bibs are assigned to Wave 2. Blue bibs are assigned to Wave 3. Yellow bibs are assigned to Wave 4. There are additional toilets at CVS Pharmacy parking lot on the way to the start line. Please use these units and NOT private property. Trespassing is illegal, and the law will be strictly enforced. Violators are subject to immediate disqualification and possible action by local law enforcement officials. Clothing left at the Athletes’ Village, Start, and Finish will be donated to charity. Please start in the corral and the Wave to which you have been assigned. Your starting corral is printed beneath your runner’s number on your bib. You may move from your assigned Wave to a later Wave. For example, if you are assigned to Wave 1, you may move back to Wave 2, Wave 3, or Wave 4 in any corral EXCEPT the first corral in any Wave. However, you may NOT move to an earlier Wave. For example, you may not move from Wave 4 to Wave 3, from Wave 3 to Wave 2, or from Wave 2 to Wave 1. Violators are subject to penalties and/or disqualification. Cooperate with the marshals at the Athletes’ Village, Start, and Finish. Participants will not be allowed to warm up in front of the starting line at any time. For safety reasons, animals, strollers, in-line skates, skateboards and like vehicles of any kind are not permitted. Although the B.A.A. discourages the use of potable music players/mobile phones, and headphones, they are allowed except for those athletes who declare themselves eligible for prize money. Violators are subject to disqualification. Those who are not officially registered in the Boston Marathon will not be allowed to participate. Official participants are asked to discourage family and friends who are not officially registered participants from entering the course in any manner. Many people want to participate in some way in the Boston Marathon as a display of support, but those who are not official participants are asked to refrain from entering the course for the safety of the official entrants and themselves. There are several other opportunities which enable a show of support for the Boston Marathon, including the B.A.A. 5K on race weekend, attending the Boston Marathon Expo, volunteering, or spectating. Anyone on the course for any distance who has not been assigned, or is not displaying, an officially issued bib number from the B.A.A. is subject to interdiction. The B.A.A. reserves the right to remove any person from the course who is not displaying an official bib that has been assigned by the B.A.A. Similarly, units or groups such as military ruck-marchers, unless officially sanctioned, and cyclists will not be allowed to participate.